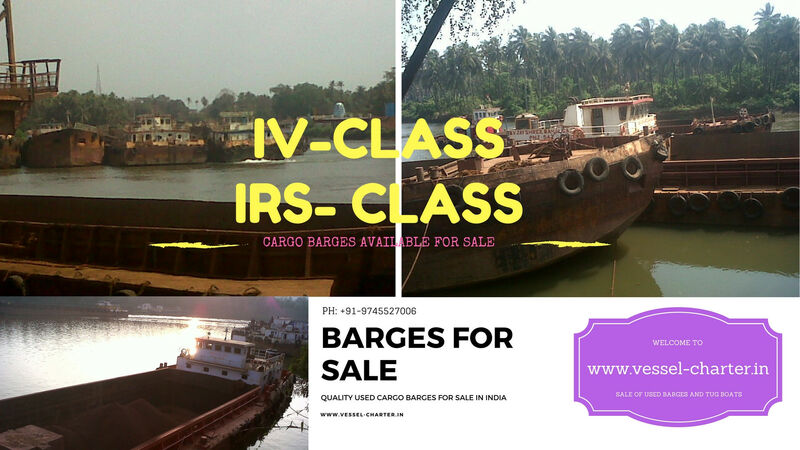 We provide complete solutions for the sale of quality used barges available in India and are registered under IV Class as well as IRS Class. These available barges are fully self-propelled with engines ranging from 250 HP to 550 HP and above. We also provide complete solution of documentation and recondition along with upgrading of the available barges on demand. Contact us anytime for all your requirement of cargo barges with single hatch. Capacity : 1800 DWT to 2000 DWT / 2200 DWT. We also arrange flat top barges, tugboats, dumb barges, water barge, oil tanker, crane barge, pipe laying barge etc. Barges in India are available mainly for inland water ways or for loading and discharging cargo from mother shop at anchorage. These barges are self propelled and available on both Time Charter as well as Voyage Charter. The inland barges are mainly I.V class with permission only operating within port limits. These barges are self propelled and can move at their own with help of marine diesel engines. The carrying capacity of these barges is available between 500DWT to 2500DWT or above. The I.V Class Barges Operates for short distance voyage.